A New York woman is facing animal cruelty charges after authorities said she was caught on camera choking and throwing a 6-month-old puppy. 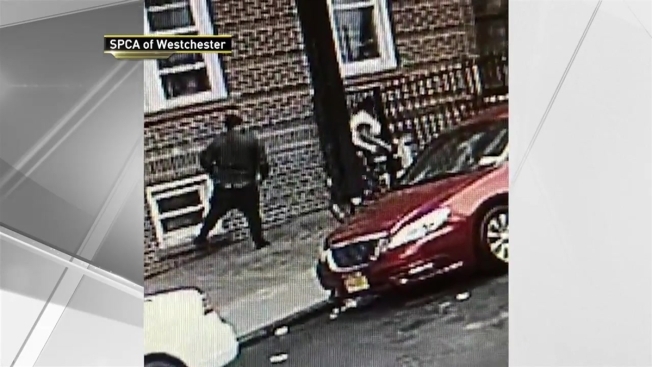 Kiani Wright, 43, was arrested earlier this month after authorities got a call about the dog, named Pebbles, being abused outside a home in Yonkers on May 13, according to the SPCA of Westchester. Surveillance footage from the scene shows a woman matching Wright's description walking outside to retrieve Pebbles, who was being held by another man. The woman then grabs the cowering dog by the neck, choking it as she carries it back to her front stoop. Then, the footage shows, she chucks the animal into the door and kicks it inside. The SPCA said Wright was arrested after they found the video. Pebbles was taken from the home and will be put up for adoption. "This beautiful puppy can now be given a second chance at a happy life," said Shannon Laukhuf, the executive director of the SPCA of Westchester.